Anyone else buy from FREEDOM MUNITIONS? I bought (6) boxes of .40 cal. (4 boxes) 180 gr. XTP & (2 boxes) FMJ 180 gr. You can choose NEW, or RECONDITIONED type ammo. Your first order is FREE shipping. The the reason I won't buy from them any more is because they have RIDICULOUSLY HIGH shipping charges! That is always the case with Internet purchased ammo. If the prices seem too good to be true, it's usually because they make it up on the back end in shipping costs. You have to research and figure the cost per round DELIVERED. Because that is often not how it's advertised. Like you I used them one time for the free shipping. Their shipping is also painfully slow. I�ve started using Outdoor Limited since they�re local and I can pick it up. When I just want a few boxes of ammo I buy from ACADEMY. They offer FREE shipping $25 and over. And, they have GREAT prices on ammo. Shipping is usually 2 days, 3 at the most. 1. Many decapping rods will not pass through the internal shoulder. 2. 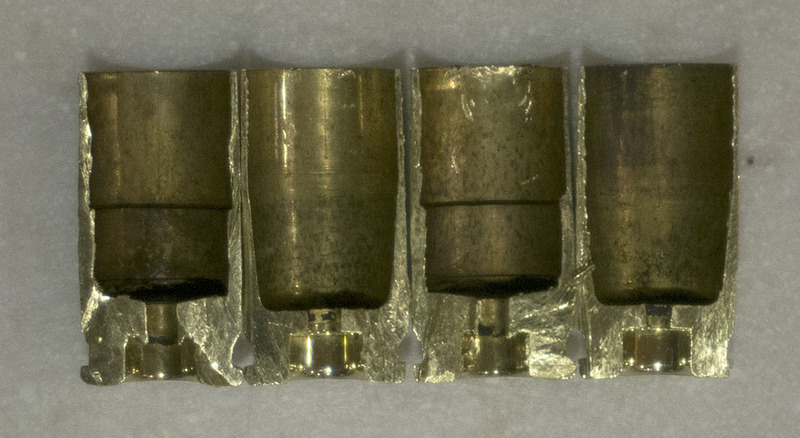 The case can separate at the step (it is a stress point) leaving a sleeve of brass in the chamber of the weapon which can render it "dead" at the range (if one does not have tools) and it can be very difficult to remove from some chambers. I do not shoot it, but others have had good luck with their ammunition. I bought from them a number of years ago-a few hundred rounds of 9mm, a few hundred of 38 special, and maybe 100 357 Mags. That was before I started reloading. I will say all went bang and was as accurate as WWB, albeit probably a bit dirtier. At the time, I was planning on starting to reload, so I bought both the 38 and 357 in new brass. Both were in Starline brass, and the 357 Mag was nickel plated. I'm still using the brass. I don't reload 9mm and think I gave away all the brass. As I recall, it was a mix of common headstamps- F.C, Blazer, Winchester, R-P. I'd be unhappy to get brass that looks like the above-it looks like a pain to reload plus would pretty well lock you in to only one weight of bullet. I'll also mention that I bought bullets from them once-158gr plated .358. They were okay, but once I paid shipping they ended up being about the same price as Berry's from Cabelas locally and a bit more expensive than some other plated bullets bought locally. Is that a washer pressed into the case to a given depth? Or is it a stepped sleeve that contacts the bottom of the case to prevent bullets from seating deeper into the case from recoil? I'm having a hard time visualizing it. The case on the right looks as if the "washer" has come loose, and fallen out. The flash holes look a mile deep, and look like funnels. Or is that an optical illusion? What am I not seeing? That brass looks like no other centerfire brass I�ve ever seen in person or in a picture. Possibly from some kind of training round like Simunition? It is stepped (but not a sleeve--it is all one piece) and the one piece of brass that does not have the step is another brand. The ID of the case is smaller below the step and the wall is much thicker. Visualize a case where the ID of the area below the step is smaller and the upper part drilled out to a larger ID. The concept is to prevent setback of the bullet and while it does do that, it comes at a cost. Always free shipping on 1000 rounds. Yes, and thanks. So just to be clear, if you sectioned the case below the step, would the case wall be considerable thicker? If so that would be useful in shooting high pressure +P+ loads in an unsupported chamber. No case bulge, or risk of a case being blown out. Assuming you would be able to get enough powder in it due to the thick case walls. The more I think about that case design, the more it worries me. As I'm sure we all know, a brass case by itself is not very strong. The strength comes from it forming to the chamber and effectively acting as a gasket to keep all the combustion gases inside the chamber. Of course, the "springiness" also lets it spring back enough to be extracted. I know setback is always a concern in bottom-feeders, but the "step" looks like it would reduce case volume by a lot more than a few millimeters of setback. I'm sure Freedom has "recipes" to load them safely, but with the case volume reduced that much I'd be afraid to even try loading the case myself. You'd need to either use a very slow powder or reduce the amount significantly to keep from getting crazy pressures. The former(using a slow powder) often doesn't work that well in "normal" bottom feeder cartridges as it may not reach peak pressure fast enough to cycle the action reliably. Wow-that's a SERIOUS reduction in case volume-not only does it have the step but the case head is a lot thicker. I'd be interested in knowing what the actual volume is.